OK, I spent the last hour getting these two ready for public release. The updated DoubleMA includes more moving averages, and also a new Signal dataseries for strategies, as well as a new DMV dataseries which correctly lists the last close of the bar (a failing of the original design). The new ChannelThis indicator allows you to plot any two moving averages into a channel with various display options to identify breakouts or kill zones. Great work. I tried the Channel indicator, but I seem to have really zig zag lines and not smooth. I tried to set it up with the same settings that you had on your screen. Try increasing the ATR value, it will smooth it more depending on what chart you are on. Try ATR of 5, 9, 21, etc. If it still doesn't work, can you post a pic on tinypic.com and link back? OK. I just followed the setup values you had on the screen shot. It does seem to be ok if I spread it out. If you set the CalculateOnBarClose = false, the price panel compresses, I think because one of your values then becomes set to zero in your data series. Also you have commented out the painting of the DrawArrowUp/Down on lines 176 and 184. I use range charts most the time and forgot to make the ATR higher by default (which has no effect on range charts). I just modified the zip on Ninja's forums to set the ATR to 9 by default. If anyone downloaded the earlier copy and is seeing jagged lines, increase the ATR length some and play with the moving average types and values to get it where you want it. The price panel bug you mentioned is when a moving average returns 0. I have noticed this happens with some moving averages, like ZeroLagEMA and some others. Not all do this. I suggest leaving it to calculate on bar close true. I have not spent any time figuring out why some MA's return zero (or NaN). I usually just write stuff for my own use, and I use smaller charts like 4 or 6 range on the ES so calculateonbarclose = false is not incredibly useful for me. As for the arrow comments, yes you are right sorry -- my bad! I had to go back and remove all my custom moving averages and have already put them all back in as to not break my own strategies, so I won't be updating the zip to fix this problem. Also, original credit goes to Rollins for the design of DoubleMA, not me! Just wondering about trending days like today. Do you look at re entries from a bounce of the Double MA. We never really crossed it all today. Just wondering how you go about trading it. I will post a new video about today soon that answers your question. I love your ChannelThis indicator as previously was using the VMAZones and liked that also. I trade the ES and only use a 6 Range chart as the entries can be anticipated. It seems to be very close to your DoubleMA version if the same settings are applied. I am trying settings of 1; 1.5; 9; VMA; 21; ADXMA; [would appreciate learning of other people's setting ideas] and take longs (green candles) that close above the yellow or blue zones and shorts (red candles)that close below the yellow or red zones. Continuation trades with the trend appear to work very well also when price dips into the zone then closes above/below to allow longs/short trades to be taken (yesterday a good example). Range charts are great as they allow stop limit orders to be place a tick above/below the reference candle and allow price to fill me (or can cancel if price reverses). I also use ECO2New and the crossovers and relative positions of the main and signal lines are excellent filters. One point - I note that when saving the chart template, the Region Coloring colors for ChannelThis are lost and must be manually re-entered each time the template is loaded. No big deal, but would be nice not to have to do this. Also, it would be useful for my trading strategy to be able to have ChannelThis "Calculate on bar close" set to false, which does not presently work as previously commented. Keep up your great work, I really appreciate it! I will look into the ChannelThis color issues and if I ever come up with a solution for the zero (C# NaN) problem on some MA's I will re-visit. However it may take me a while, I have a lot going on, sorry. I took a look at your settings and agree it is very close to my DoubleMA version. Also keep in mind multipliers below zero work, if you want a smaller channel. 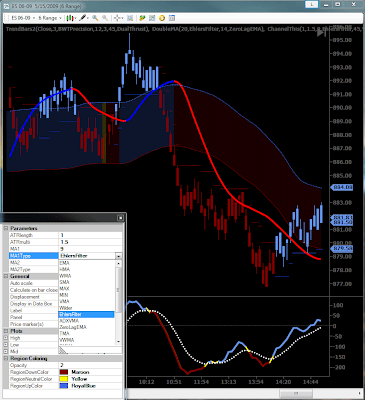 By default Ninja's C# editor puts a + sign (plus sign) in the NinjaTrader.Indicator.MAV line instead of a dot. That might be the hang up. Or, it could be that I didn't comment out one of my proprietary moving averages from the MAV.cs file, take a look at both. http://tinypic.com/view.php?pic=mcdwd2&s=5. When you click "Indicator" and "Ok", it will get back to normal and after awhile the same thing will happen again. Not sure what's wrong? Don't use calculate on bar close = false.